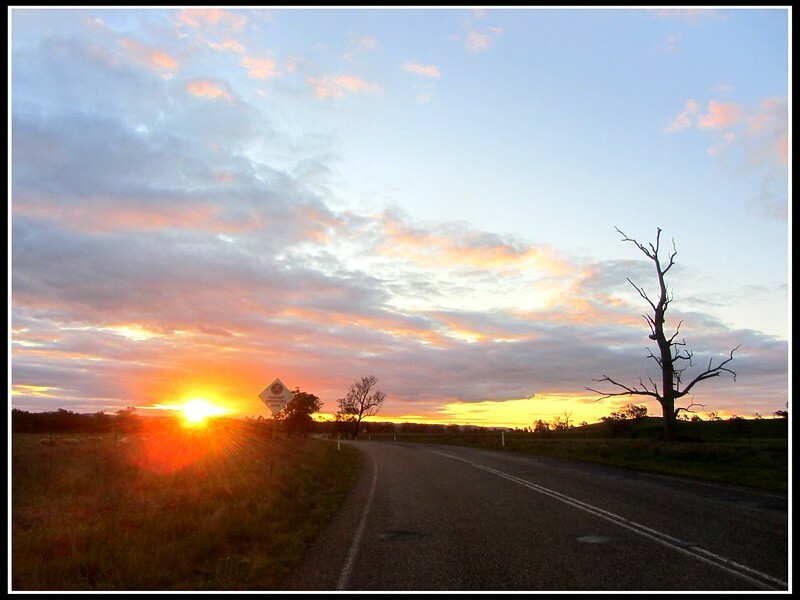 Melbie to Brisso Roadtrip, Day 1! Well I've fallen woefully behind again. Real life is the enemy of posting on lj. As is sunny weather, which deceitfully makes one feel like one ought to be outside in the fresh air! So unfortunately I won't be able to add pictures and links to this until I have internet access. I believe I left off just about two and a half weeks ago, whereupon I had just departed Sydney for Melbourne. Let's see it would really help jog my memory if I could look up a map right now but, yeah, about that. The towns we rolled through reminded me of the Old West ... a dozen or so shops with large facades facing the main street (which had become the highway), and had silly names like "Wagga Wagga." Driving through one such town (Holbrooke? ), what do we see but a SUBMARINE. Like, a full sized freaking naval submarine, probably 100 yards long and conning tower looming above the trees! This definitely warranted stopping to investigate! 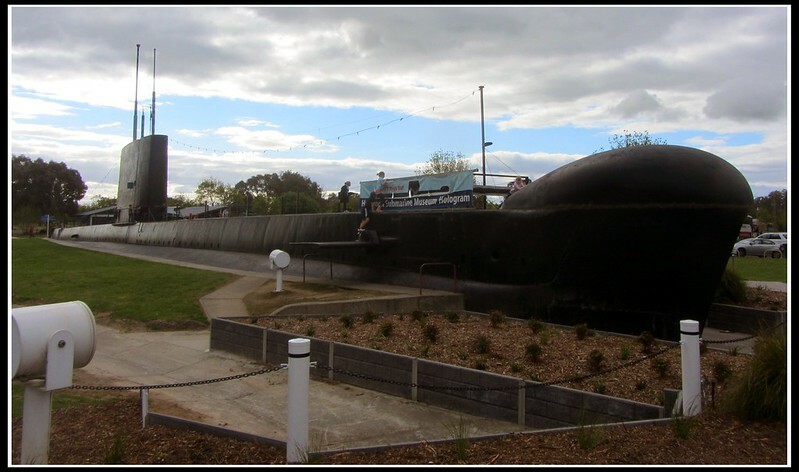 The submarine was located in a park, with just the top half of its hull above the ground, as if it was sitting in water, with kids clambering all over it. It was actually just the outer hull, empty inside of the pressure hull and everything else. Really its a good idea, since it can't be terribly hard to move the upper half of the external hull of a submarine, and it makes an awesome and eye-catching edition to a park. As to what it was doing in the town of Holbrooke, so very far from the sea, well, according to the informational sign, the town had been called "Germantown," but that wasn't a very popular name during WWII, so they renamed the town after, I believe, an Australian submarine hero of WWI ... and this was a subsequent submarine named after the same fellow? They also had a 1/5th scale replica of the WWI submarine in which the eponymous Lt Holbrooke sailed up the dardanelles and blew up some Turkish warships, or something. There was a museum on site even, but it cost money and we were in too much of a hurry to spend money seeing something we would rush through. Somewhat further along we noticed on the rather shoddy map we were using the denotation "Dog-on-the-Tuckerbox Somewhere Near Here" near the town of Gundagai (does Gundagai feature in some song or something? I swear it sounds and sounded super familiar), as if this was something exciting and worth seeing. 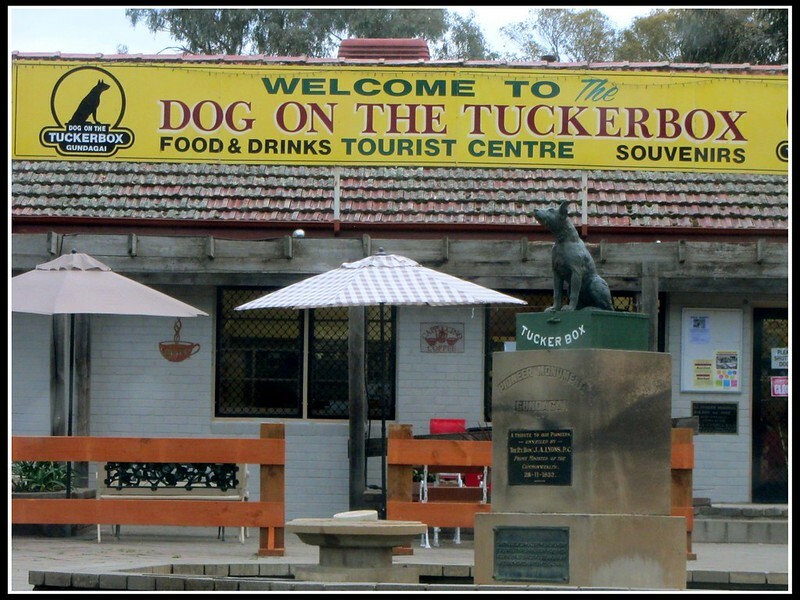 At the exit for the town we saw another big sign for the Dog-on-the-Tuckerbox and go off the highway. It turns out it wasn't in town, but we did find a historical really long decrepid looking bridge. We found more Dog-Tuckerbox signs directing us back on the highway and about 5ks and 3-4 more excited signs later, we came to the legendary DOG ON THE TUCKERBOX tourist center! Yep. Thats the dog on the tuckerbox right there. Needless to say. We pulled up. Looked at eachother with WTFness, described the tremendous let-down of the place in colourful language, and went on our way without even getting out. Said dog-tuckerbox-monument even has a wikipedia entry! We proceeded on to the town of Young, where we discovered that throughout the state of New South Wales (which is most of the space between Melbourne (in Victoria state) and Brisbane (in Queensland state)) in nearly all the small town the parking in the central area is "60 degree rear-to-curb." Meaning you have to BACK in at an angle, and are then pointed the right way to drive right out. This seems far more tedious to me (and to Cass) than the more normal nose-to-curb arrangement. While we were looking for a place to stay I discovered another peculiarity -- it appears that all hotels are authorized to serve alcohol ... but not all hotels actually have rooms for rent! Ie, some "hotels" are in fact nothing but bars! I think these bars were in fact formerly functioning hotels and kept the name when they became merely a bar, but nevertheless, we encountered several of them. 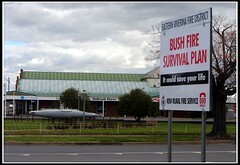 Had a delicious dinner at the "RSL Club" in town... apparently such places can be found in nearly every town in Australia, I don't know what the letters stand for but its basically the veterans clubs -- but they all (at least the ones I've been to now) serve really good food and are open to anyone (though you have to fill out a "temporary membership form" every time you go in). ...and that's it for Day 1!